Midfielder Olly Lee wants to realise his full potential at Luton Town after agreeing a contract extension last week. The 24-year-old, who moved to Kenilworth Road from Birmingham City in August, penned a deal until the summer of 2018. Lee, who has scored some wonderful goals for the club in his time, including efforts at Hartlepool, York and Oxford, believes there is plenty more to come, as he said: “I have to get a lot better and that’s what I’m looking forward to doing, that’s what I’m all about. “I’ve spoken to the gaffer and spoken to Nuge (Kevin Nugent, first team coach) as well, there’s lot of hard work to be done. “I’m always looking to improve, so I can’t wait for next season and showing everyone how much better I can be. 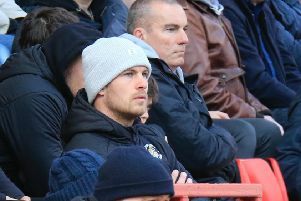 Manager Nathan Jones felt that the capability to improve was one of the main reasons behind extending Lee’s stay in Bedfordshire. The boss said: “He’s a good age, wants to learn, get better, will have to get better if he really wants to kick on in his career. “He’s chipped in with goals, chipped in with assists, he has some wonderful ability. Lee was thrilled to receive such backing from his manager and believes that under Jones’ guidance, both he and the squad will make vast improvements. He continued: “The gaffer’s been brilliant with me and I’m hoping to repay him even more next season. “He’s put a lot of faith in me, and I enjoy the way he plays and the way we train, so hopefully for us it’s just onwards and upwards. “I think personally, the few months the gaffer has had so far is going to stand us in great stead for next season. “We know the way he wants to play, all the lads are used to it and his methods and his training are excellent. “I think we can hit the ground running as the start is so important for next season. “Start well, take some momentum into it and then who knows what can happen? Lee’s appearance on Saturday for Town was his 39th of the campaign, easily the most he has made for a club after starting out at West Ham. The best he had managed previously was 24 when on loan at Dagenham & Redbridge and then Gillingham, while he also played 20 times for Birmingham in the Championship. The brother of former Town loan striker Elliot Lee admits to finally feeling settled now for the first time in his career, adding: “Definitely, it’s taken a long while coming, so to get a nice run in the team, I’ve really enjoyed it.